RUSSIAN police are probing a mystery crash between two objects in the skies above Vladimir Putin's hometown. Student Ana Zhmaeva was convinced she had just seen a mid-air plane crash when she began to record the incident in the air over the western city of St Petersburg, where Russia's president was born. Ms Zhmaeva immediately reported the unexplained incident to police but they have since been unable to locate any crashed objects and no plane collisions were reported at the time. 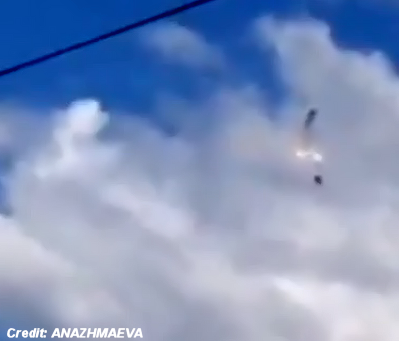 The footage, which is now with the authorities, appears to show two objects collide with a bright flash before one of them plunges to the ground and fragments seen scattering in the cloud. Ms Zhmaeva said: "When I started filming the UFOs [Unidentified Flying Objects] disappeared like they had exploded or crashed into each other." . . .